Google Analytics (GA) is a great tool for collecting and analyzing web site data, but it’s not without its limitations. If you need to run more advanced analyses, you probably find yourself pulling the data out of GA and putting it into other complementary tools, such as R, Tableau, Shufflepoint (and more!). Today’s focus will be on CausalImpact, an open-source package in R developed by the data gurus themselves (Google). Let’s say that, on average, you get 100 sessions/day from organic search traffic without any advertising efforts. Then, your team decides that it would be a good idea to run a paid search advertising campaign for a new product or service that was just launched. After beginning the campaign, your sessions increased, on average, from 100 sessions/day to 200 sessions/day. Your team is super excited! Why wouldn’t they be? Your average sessions/day doubled! Now let’s look a little closer… In Google Analytics, you can see the number of sessions/day that came from your paid advertising efforts. You notice that it says 125 sessions came from your ad. Wait a minute! It appears as though 25 ((200 combined organic and paid sessions) – (125 paid sessions)) of your sessions from organic search were “cannibalized” by your ad! In other words, based on the history of your site, you could’ve expected to get approximately 100 sessions/day without advertising. Therefore, although it may seem that you got 125 sessions from your ad, you actually paid for users who would’ve come to your site regardless. So how can you see the number of additional sessions that actually came from your ad, especially since you don’t know what would have happened to your traffic if you didn’t run the ad? Glad you asked! CausalImpact looks at the net difference between the total number of a certain metric, say sessions, that you would have received without the advertising campaign (model predicted value) and the number the same metric that actually occurred (data in GA). 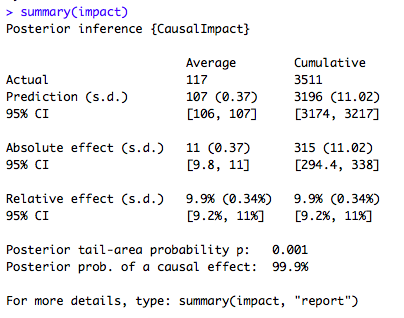 CausalImpact is majestic in that it uses causal inference, which looks to see if something is likely to be the cause of something else, to predict the value of your desired metric. In this case, it uses Bayesian statistics in structural time-series models to determine whether or not the causes are related. 1. The control is not affected by the marketing intervention. 2. There’s a stable relationship between the control and the affected segment from pre.period through post.period. 3. You have an understanding of the spike and slab prior in the time-series model. Any number of extraneous conditions (anything besides your advertising efforts) could cause an increase or decrease in your web site traffic. So as per my previous example, you may indeed receive 100 sessions/day, on average, but what if your traffic increased to 200 sessions for a few days due to an extraneous condition (such as bad weather leading more users to be online). I’m sure you can see how this could skew your results! In order to get around this, the time-series model allows you to use a control for more accurate data. One of the most popular ways to get this control is to create it! Thus, it is deemed your “synthetic control”. Consider the following… Looking at the entire month of March, you ran an ad that targeted users in Pittsburgh from March 15 through March 31; however, New York City was a similar metro that didn’t have an ad running at any point during the month of March. As a result, your control would be a segment of traffic from New York City from March 1 through March 31, and your actual data would be a segment of traffic from Pittsburgh from March 1 through March 31. Essentially, you need to compare similar segments in order to yield accurate predictions: One segment with the marketing intervention and one segment without. Now you may be thinking, This sounds great and all, but it seems too complicated. Alas, have no fear! The explanation is here. Please note that you need to pull your segment of data by its ID, which is admittedly tricky to find! One way to find your segment ID is to apply the segment to the All Pages report, and then look towards the end of the page URL. Everything after the word "user" is your segment ID, and should be added into the following format: gaid::segmentID. head(workingData) # Now we're talking! Define your pre.period and post.period! Warning - Nothing will show up on your screen just yet. Isn't it B-E-A-U-T-I-F-U-L?! 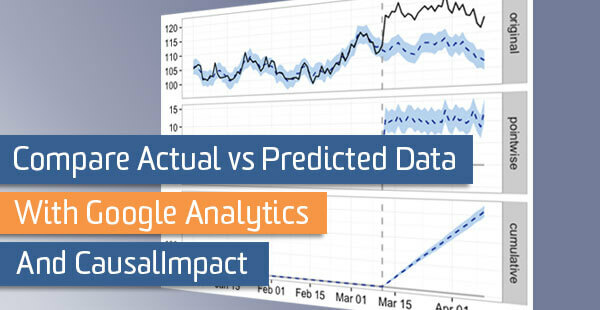 For the purposes of keeping Google Analytics data confidential, we used the same simulated data that Google used. The net difference between the observed and predicted response on the original scale, or the difference between the solid, black line and the dotted, blue line on the original graph. 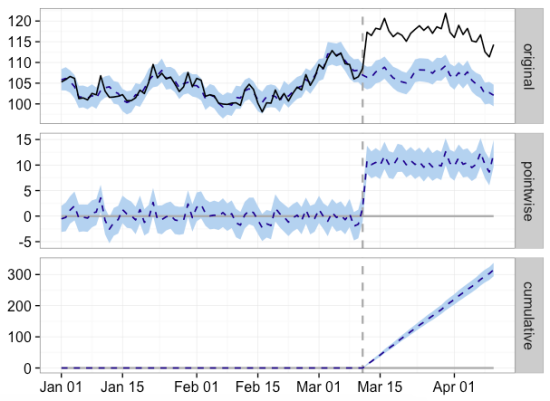 Dotted, Blue Line: Individual causal effects added up in time, day after day. For all three graphs, the light blue shaded area represents the results in a 95% confidence level. The farther that the graph extends past the beginning of the intervention, the less certain of the causal effect; hence, the larger the shaded area. Moving forward, CausalImpact can help you better understand the peculiarities in paid advertising by determining how much additional traffic you actually receive from running your campaign. With this information, you can see a strong prediction of how many organic sessions were cannibalized by your advertising efforts. Therefore, you can refine your advertising campaign strategies accordingly. Taking it a step further, you can use these strategies to compare the data you received with the expected data predicted by models with synthetic controls.